Chard is a leafy green vegetable that is usually used in Mediterranean cooking. Chard (Beta vulgaris subsp. cicla), Swiss chard, silverbeet, perpetual spinach, spinach beet, crab beet, bright lights, seakale beet, or Mangold is a leafy green vegetable with the leaf blade being green or reddish and the leaf stalks being usually white, yellow, or red. The vegetable is most often used in Mediterranean cooking. In the Northern Hemisphere, chard is typically ready to harvest as early as April through May. Chard is one of the hardier leafy greens, with a harvest season usually lasting longer than kale, spinach, or baby greens. Here are 7 health benefits of chard. 1. Chard can help fight cancer. Dark leafy greens like chard, contain antioxidants like beta-carotene, lutein, zeaxanthin, quercetin, and kaempferol. Antioxidants find and neutralize free radicals, which are the dangerous byproducts of cellular metabolism that can cause healthy cells to become cancerous. 2. Chard can help manage diabetes. Chard contains the compound syringic acid, which has shown to regulate blood sugar levels by inactivating the enzyme alpha-glucosidase. This inactivation was shown to inhibit the breakdown of complex carbohydrates into simple sugars, helping stabilize the body’s blood sugar level. 3. Chard can contribute to improving eye health. Chard is loaded with the antioxidant beta-carotene. Beta-carotene consumption has been linked with improved eye health and the risk reduction of macular degeneration, glaucoma, night blindness, and other vision-related conditions. 4. Chard can help decrease blood pressure and improve heart health. Chard contains high potassium and low sodium. Chard also contains antioxidants that contribute to reducing blood pressure and stress on the heart. 5. Chard can progress hair health. Chard contains the organic compound biotin. Biotin has been associated with the stimulation of hair follicles and increase hair texture. 6. Chard can improve bone health. Chard is a good source of calcium, magnesium, and vitamin K. Sufficient vitamin K consumption performs as a modifier of bone matrix proteins, improves calcium absorption, preventing bone loss and osteoporosis. 7. Chard can improve blood circulation. 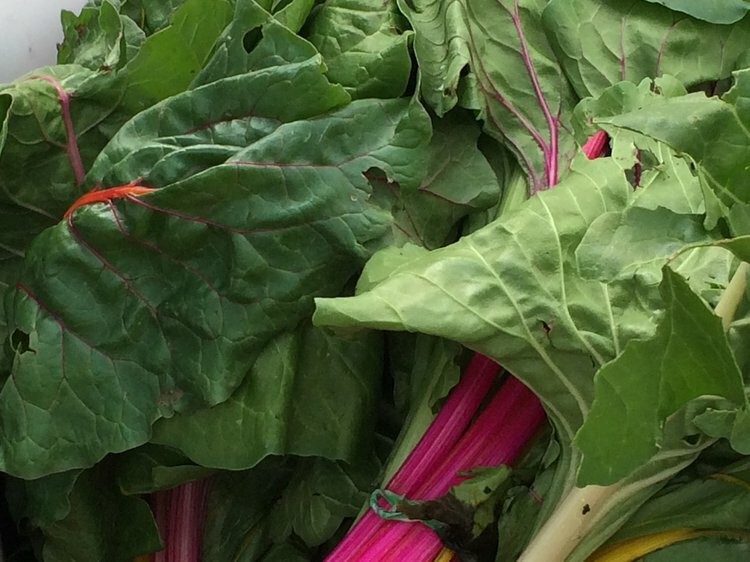 Chard can improve red blood cell formation by containing iron and copper. Individuals who are deficient in iron and copper can develop anemia, a condition resulting in weakness, fatigue, stomach disorders, and lack of concentration. Neelwarne, B., & Halagur, S. B. (2013). Red beet: an overview. In Red Beet Biotechnology (pp. 1-43). Springer US. Ninfali, P., Bacchiocca, M., Antonelli, A., Biagiotti, E., Di Gioacchino, A. M., Piccoli, G., ... & Brandi, G. (2007). Characterization and biological activity of the main flavonoids from Swiss Chard (Beta vulgaris subspecies cycla). Phytomedicine, 14(2), 216-221. Kugler, F., Stintzing, F. C., & Carle, R. (2007). Evaluation of the antioxidant capacity of betalainic fruits and vegetables. Journal of applied botany and food quality, 81(1), 69-76. Ozsoy-Sacan, O., KARABULUT-BULAN, O., Bolkent, S., Yanardag, R., & Ozgey, Y. (2004). Effects of chard (Beta vulgaris L. var cicla) on the liver of the diabetic rats: a morphological and biochemical study. Bioscience, biotechnology, and biochemistry, 68(8), 1640-1648. Pokluda, R., & Kuben, J. (2002). Comparison of selected Swiss chard (Beta vulgaris ssp. cicla L.) varieties. Horticultural Science, 29, 114-118. Gao, Z. J., Han, X. H., & Xiao, X. G. (2009). Purification and characterisation of polyphenol oxidase from red Swiss chard (Beta vulgaris subspecies cicla) leaves. Food chemistry, 117(2), 342-348. Innis, S. M., & Allardyce, D. B. (1983). Possible biotin deficiency in adults receiving long-term total parenteral nutrition. The American journal of clinical nutrition, 37(2), 185-187.